It’s done and (almost) dusted! 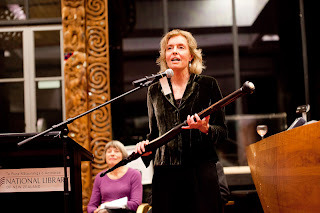 The laureateship is finished (long live the laureateship) and in Wellington on Tuesday 30 June the book and the cd were launched in style at the National Library. 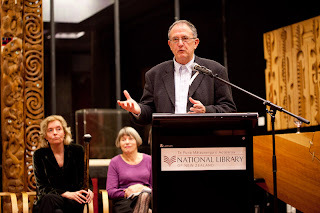 Chris Szekely, head of the Alexander Turnbull Library, was MC for the evening, introducing Sam Elworthy, Auckland UP’s publisher and Ian Wedde, who launched Mirabile Dictu. Congratulations to Ian who is the just-announced 2009 University of Auckland / Creative NZ Writer in Residence at the Michael King Writers’ Centre. 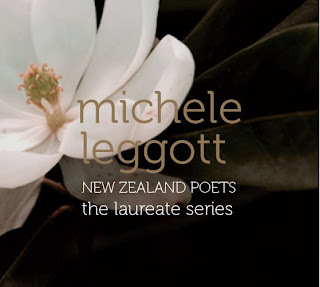 Elizabeth Caffin, long-time director of Auckland UP and publisher of my books 1991 through 2005, then launched the third cd of New Zealand Poets / The Laureate Series, a selection of my work from Like This? (1988) to Mirabile Dictu. My thanks and admiration go to Robbie Duncan and Chris Price of Braeburn Studio for their dedication to the task of getting quality recordings from the difficult situation of a sight-impaired poet reading from a touch screen laptop. It seems to work, but only after much technical ingenuity on Robbie’s part. The finale of the evening was a words and music performance by Robbie, Chris and I of ‘letter to dulcie jackson,’ my grudge poem about the frustrations of learning to touch type at the end of last year. 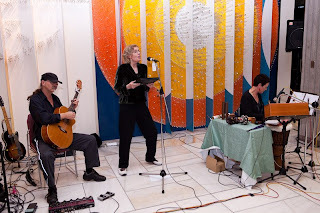 I still don’t type fast or very well, but the poem is a lot of fun to perform, especially with the addition of musicians and Aesop, the talking keyboard on loan from the Foundation of the Blind. ‘letter to dulcie jackson’ is in Mirabile Dictu and on the cd.